When it comes to buying a mattress you don’t want to rush into making a decision. With the amount of options to choose from it’s much better to take your time and find the one that will provide a good night’s sleep. At John Ryan By Design we specialise in selling mattresses of the highest standard. The foundation of our business has been built on the knowledge we have of the mattress industry. Attention to detail is of the utmost importance to us, meaning we’ll take you through every step of the mattress buying process. We want you to know about the material, size and build quality so you can make an informed decision. We’ll provide an honest recommendation on all of our products, including the range of luxury king size mattresses. Some of the most comfortable mattresses we offer include Man Made pocket sprung and Natural Fibre pocket sprung. Size and weight are crucial factors for deciding on the mattress that’s right for you. Mattress dimensions will help to decide whether you’ll be comfortable sleeping in the bed or not. What are the dimensions of a king size mattress? Once you know the right dimensions you can decide on the mattress that suits your preferences. What types of king size mattresses do we offer? Our extensive range of king size mattresses are designed with comfort and practicality in mind. The Origins Pocket 1500 is a great example of the kind of mattress that we offer. It comes with 1500 pocket springs and provides plenty of support. It’s ideal for anyone who’s looking for an affordable king size mattress, and it comes with a three year guarantee. For anyone who’d like a bespoke king size mattress then we offer the Artisan Naturals. 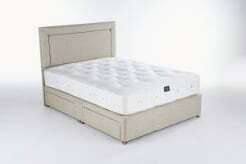 This mattress is a Calico spring unit that comes with a 10 year guarantee. We’re not interested in any sleight of hand when it comes to selling mattresses. We’re focused on giving you a personal service that covers price, material, size and overall quality of a mattress. An integral part of our business is the 60 day ‘Love It or Return It’ guarantee. This works on the understanding that if you aren’t satisfied with a new mattress within 60 days then we’ll come and collect it. All you have to do is call us and we’ll do it free of charge and give you a refund. There’s no point in having a mattress that doesn’t meet your expectations. Feel free to get in touch with us on 0161 437 4419 for more information on buying a king size mattress.